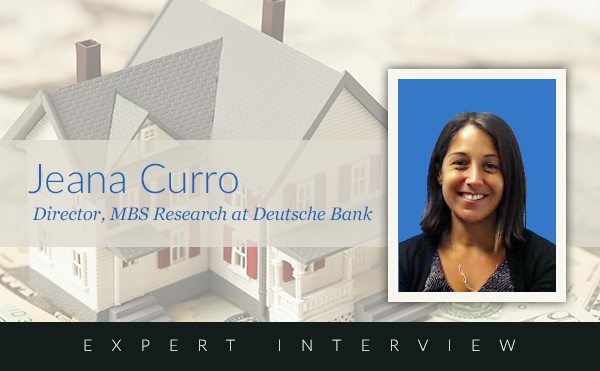 Jeana Curro, Director of Mortgage Backed Securities Research at Deutsche Bank in New York, talks about how government backing and mortgage investors drive down interest rates and make home loans more attainable for the average consumer. Tell us a little about yourself and your role at Deutsche Bank. I recently joined Deutsche Bank this year as a Director of Agency Mortgage Backed Securities (MBS) Research. Here I spend a lot of time examining the government mortgage market and the securities backed by Fannie Mae, Freddie Mae and Ginnie Mae. I propose trade ideas suitable for institutional accounts as well as opine on housing policy and provide up-do-date commentary. Prior to joining Deutsche bank, I held similar roles at the Royal Bank of Scotland, where I lead the Agency MBS research team, as well as UBS Investment Bank. 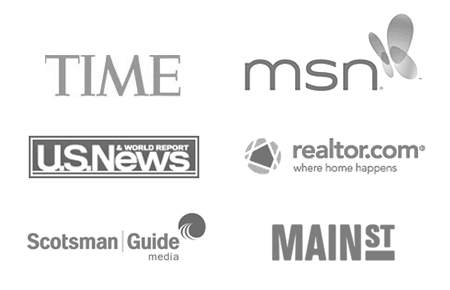 What do you like about researching and reporting on government backed mortgage securities? How did you get into this area of the finance industry? I became fascinated in mortgages because of their embedded optionality, i.e. determining if and when a borrower will prepay his loan. That decision leverages on a quantifiable incentive as well as borrower behavior. The combination of numbers and behavior has always intrigued me. I have a bachelors degree in Mathematics with a minor in psychology, which is a rather unique background but a perfect fit for my role. Research allows me to really explore opportunities in housing finance that are of interest to me. With the whole mortgage finance model currently under a microscope, there is no shortage of things to talk about! Many mortgage consumers don’t fully understand the relationship between government backed mortgages like Fannie Mae, FHA and VA, and investors. Can you explain this? When a homeowner takes out a mortgage, that loan is typically made by a bank or mortgage lender, not the government. However, Fannie Mae, Freddie Mac, FHA and VA are all government entities that make mortgage finance possible. They set their own eligibility requirements and if mortgage loans fit their parameters, the entities will guarantee the loans against default for the investors. These loans then get guaranteed by Fannie Mae, Freddie Mac or Ginnie Mae (the securitization outlet for FHA and VA loans). Now, the MBS investor is not taking on the credit risk of the individual homeowner, but instead the risk of the US Government. The role the Agencies play is critical to broadening the investor base for MBS which ultimately helps facilitate mortgage lending to borrowers nationwide. Why are private investors interested in buying mortgages? Mortgage Backed Securities typically offer investors a higher yield than other fixed income assets. Additionally, Agency mortgages carry the backing of the US government, so there is no default risk. A common comparison is between Agency Mortgages and US Treasuries, since both are government products. At current levels, MBS returns are approximately 1% higher. The risk to MBS investors is really prepayment risk, if a borrower moves houses or refinances his loan, the principal is repaid in full but the loan matures quicker and the investor misses out on a future stream of interest. Contrary to popular belief, the government does not control mortgage rates. How does investor demand affect rates? Investor demand essentially sets the price and rate for MBS securities. If demand is high, investors will be more willing to buy at lower rates. If demand is low, as it was at the peak of the crisis, the only way to get investors back is to push rates of return higher. Unfortunately, this means charging the borrowers a higher rate. You recently researched VA mortgage trends. What were a few of your key findings? Did anything surprise you? It has been surprising how fast the VA loan population has been growing and what is more fascinating is that the trend is set to continue. The VA estimates that the volume of VA loans is likely to surge 36% over the next five years as more young veterans return home from the military. This means Ginnie Mae MBS Issuance could rise by $10-20 billion per year. From your research, how does a VA loan compare to an FHA or Fannie Mae loan as far as the consumer is concerned? A VA loan is unique in that it is a benefit only offered to veterans. The advantage of a VA loan is that it does not require a down payment. FHA loans require a minimum 3.5% down payment, but are available to all homebuyers (not just veterans). Only recently does Fannie Mae permit a 3% down payment. The real difference between FHA and Fannie Mae loans as far as the borrower is concerned is pricing: borrowers with higher credit scores generally receive lower rates through Fannie Mae, whereas FHA does not differentiate by credit score. According to Ellie Mae’s Origination Insight Report, VA loan rates are about a quarter percent lower than those of Fannie Mae or Freddie Mac loans. Do investors view VA loans as safer, hence the lower rates? Rate incentive is absolutely part of it, so from that perspective lower rates imply less prepayment risk and are in one respect safer. However, VA has a much more efficient streamline refinance program where no appraisal is required. As a result, VA loans can prepay faster than conventional (Fannie Mae or Freddie Mac) loans, which poses a greater risk to the investor. MBS investors are constantly weighing these trade offs when making decisions. Thank you Jeana Curro for sharing your knowledge of the mortgage market!